Last Sunday, as I was changing Jake’s clothes, (after a gallant but failed attempt to get him to the bathroom on time) I slid his leg braces off his crooked feet and stared for a while at the devices that are supposed to help him walk. 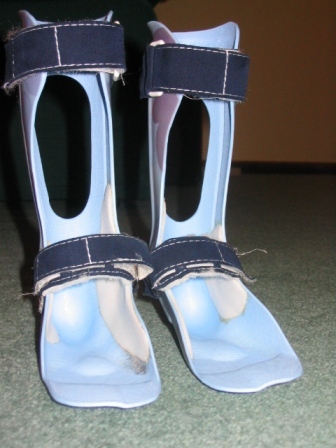 “AFO’s”: ankle-foot-orthotic. I hate them. He hates them. But like his thick glasses and his Springboard communication device, they have become so much a part of his life and body, he cannot do without them. I glanced up in time to watch Jake wrestle his coat off and then his shirt. He grunted and fought with his sleeves in a noble battle, nearly toppling over from unbalanced determination. As he struggled to free himself from his outer garment, I sensed his irritation, which only amplified my own desperation to care for this broken boy. My face seems to be scarred these days with the dried and salty tear tracks of weary frustration. I cry more than people know—more than a man likes to admit. Still I fight to keep composure, “No more tears. Someday, no more tears.” I quietly remind myself. I’m walking with Jesus through a wheat field (I’m not sure why I always envision a wheat field, it just seems right…and biblical). The sun is shining brighter than I have ever seen it shine—at least it looks like the sun, only more brilliant, loving and personal. It penetrates everything with a powerful presence. The sky is electric blue decorated with sparse, white-cotton clouds. The temperature is mild and the wind is gently blowing a hint of honeysuckle into my nose, reminding me of childhood summers when life was new and worries few. Jesus is silent as He walks, and He's smiling. He is setting the pace and occasionally turning his head to look at me. His hands are held out just below waist level as he lets them glide gently over the heads of wheat. It’s as if he has a certain purpose in mind, a surprise of some sort. His smile grows wider and warmer as we get closer to our destination. I want to look around and take in the scenery—I’m certain it’s breathtaking, but His face is all I can focus on at the moment. I cannot take my eyes off Him. He is inviting, comforting, safe and filled with so much joy! I am completely satisfied and without fear in His presence. I have a strong desire to take His hand like a little child and never let go, but all my faculties are so captivated by His presence that none of my voluntary senses will respond. I can only look on Him and enjoy—and yet that is enough. The beauty of the azure-blue sky outlines His face and the brilliance of the Great Light behind Him nearly blinds my peripheral vision as it breaks through His thick, dark hair. Suddenly He stops, closes His eyes and slightly nods His head as if answering a silent whisper. Turning towards me, He places one hand on my shoulder and with the other He touches His finger to my chin and physically, but gently, turns the gaze of my face forward to a lone figure walking from the edge of the wheat field. The unfocused silhouette begins to move towards us. His shoulders are broad and his gate is smooth, like a warrior running into battle. For just a moment I wonder if we are in danger, but then I remember I am with Jesus. As the figure gets closer, the first facial feature I can make out is a smile, warm and inviting—beaming with joy. He slows to a gallop just short of reaching us; then walks, and then stops. There is a familiarity in his presence. The wind blows through the wheat field as Jesus softly laughs and affectionately nudges my shoulder. I walk towards the lone figure, and the mysterious character places his hands on his hips, throws back his head, and laughs. The closer I get, the more I begin to understand. “Dad, it’s me!” The man proclaims with a strong baritone voice. I begin to move with urgency towards him, running hard and then falling like a child into his arms. A long embrace is mixed with rejoicing, then weeping, then astonishment and joy. Gripping him with a father’s love, I kiss his chiseled cheek and bury my face into his neck. He smells like the field—earthy, strong, clean and sweet. We stare at each other for a second and I step back, scanning him from head to toe and taking in his sharp demeanor. His hair is thick and glowing auburn like the peak foliage of a sugar maple in fall. His eyes are glistening hazel, clear and focused. With no thick, smudgy glasses to hinder his view, he returns a sharp and steady gaze. “Look…at…you!” I repeat in complete wonder. “I…I don’t think I can run right now, son.” I respond, stunned with complete awe. “Come on dad! Let’s go, on three!” He playfully challenges as he runs in circles around Jesus and me, darting straight and cutting on a dime from side to side. He is talking so fast, so eager and so clear, like he has been waiting to talk all his life. I could barely keep up with all he was saying and found myself joyfully adrift with the simple tone of his voice and the beautiful inflection of his words. His voice is smooth and beautiful, deep and articulate. It grows bolder with anticipation and excitement as his eyes move from the sky, back to me, and then to Jesus. He points to the Savior as his focus grows intent. Jesus smiles in reply to the satisfaction of his worship. “Show him your hands Jesus! Show him your hands!” Jake excitedly concludes his hymn of praise just as abruptly as it began. We talk and sing throughout the day—a day that never ends—as we stroll and run without tiring under the brilliant blue sky. We talk about the years of his disability, the suffering, confusion and pain. We talk about the things he missed, and the things I missed—the hurt and the frustration, the laughter and the joy. There is forgiveness in his tone and grace in his words—so much grace. He is so excited to tell me everything, and I am so ready to listen. Jesus is between us, in our midst. He puts His arm around Jake and reaches over and wipes my cheek with the sleeve of his garment. “No more tears", He gently commands. “Today, no more tears”. Thank you for giving a future hope focus to my tears. Thank you for being faithful to use and share the gift God has given you. I will continue to weep with you, sure of the fact that your tears will one day be wiped away for good. Thank you for sharing. I too look forward to that day. The day where my now nonverbal child will be able to talk and share her thoughts with me. 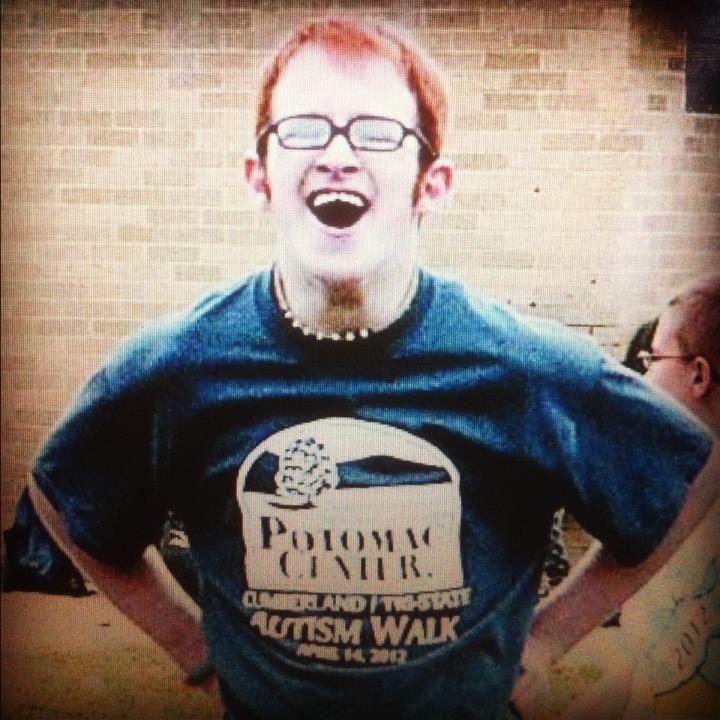 And the day where my young son with seizures and limitations will "run like the wind" and not seize from activity. Wishing you and your family God's blessings. I typed something awhile ago, but I don't see it yet. We have a "Jake" in our lives, too. Only his name is Andrew, and he is 10. I cried hot tears today ... again! Andrew has always had behavioral issues from the time I can remember. I've dodged many Hotwheel cars in our truck. I've come away from changing his messy pull-up with my hair pulled and my arms scratched. Today, I fearfully told my husband as he was returning to work after getting Andrew from school because he was being aggressive, "If I could only speak to George Lucas!!! He understands. He can pray with and for us. He's been where we are!" My husband chuckled and brought some levity to this otherwise heavy, tearful day and replied, "I don't think George Lucas can help you! He is the guy who created Star Wars!" LOL! I corrected myself before he said anything else, "I meant Greg Lucas!" We are at our wits end! Your encouragement has been priceless to us. Many days when we've struggled much the same way you do with Jake, my husband and I would collapse into bed dog tired and weary. We'd read your blog and cry, and cry and cry! If there is anyway possible to talk to you, we really need your prayers and encouragement. Would you possible be able to talk to us? Me and my wife would love to do what we can to offer your family some advice and encouragement. God will wipe our tears one day. And those breathtaking golden wheat fields! We have those wheat fields here. They reflect the amazing light of the sun. But Oh the reflection of the glorious light of Christ shining off the fields of wheat in heaven when we see our son coming to meet us. He will say, "Hi Dad" and Dad will say, "Hi Spud"
He will say, "Hi Mommy" and Mom will say, "Hi my Sunshine"
When he sees me crying now, he gently kisses me and says, "wipe the tears, Mommy is crying"
He shall wipe away all tears.......for there is no night there. We are looking forward to meeting you and your lovely wife in August at family camp. Thank you for this beautiful vision of heaven. On Monday of this past week my mother lost her battle with cancer. I can't help but imagine as i read this post that she is now in heaven walking in those same wheat fields. She is whole, her chains of cancer are gone, she is healed. She is free! Reading this the day after Easter, remembering how God comforted me over the weekend with the same words: "...no more tears..." Our "forever" Sunday's coming! This is absolutely, breath-takingly beautiful. Thank you for your transparent (and therefore, so helpful) posts. This has got to be one of the most beautiful pictures of heaven I've read or seen to date. Thank you for reminding me of the love of our Lord Jesus. I look forward to the day when He makes all things new. Having a special needs, non diagnosed and nonverbal child with multiple challenges is tough so Thank You for sharing your "walk". Parents and everyone else can learn so much if they put their heart and lives in His Hands. I can't wait to "talk' with my beautiful Kandis! I have shared the same dream and the same tears. Thank you for putting whats on my heart into words. Thank you so much for this post. I first found it years ago and have since come back to it a number of times. My father passed away when I was quite young, and your perspective has been a needed reminder that we don't grieve as those without hope.